FREE E-book Bonus: FOUR HIDDEN REASONS #Baseball #GIANTS STOPPED WINNING IN SECOND HALF #PEDs | Where Did You Go Joe Dimaggio? 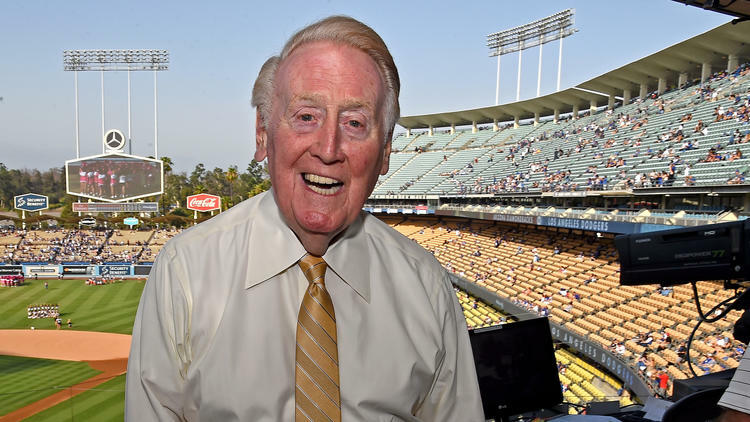 + #SFGiants will pay tribute to Vin Scully during his final game (Oct. 2) by switching to his call of third inning on CSN Bay Area and KNBR. The San Francisco Giants, you may have heard, have not had a good second half. At the All-Star break, they were 57-33. That was the best record in baseball, three games ahead of the Cubs. Since then, they are 25-41. That’s not the worst record in baseball—the existence of the Minnesota Twins ensures that—but it’s the worst in the National League. They’ve fallen from first place in the NL West at the break–6.5 games ahead of the Dodgers–into a tie with the Mets for the Wild Card and just half a game ahead of the Cardinals, trailing the division-clinching Dodgers by 8.0 games. In doing so, they remain in line to set a record for the biggest swing in winning percentage from the first half to the second half. Their drop of .255–from .633 to .378–is the greatest since the first-half/second-half dichotomy was established by the 1933 All-Star game, ahead of the 1943 Philadelphia Athletics, who followed a 34-44 first half with a cover-your-eyes 15-61 second half, a .238 decline. The Giants have to win at least four of their remaining six games to avoid breaking those wartime A’s record. ‘They’ll be fine, they’ll be fine,’ has been the mantra of Giants fans calling into KNBR sports talk , until now, following the most unexpected Giants slide in the Giants’ 60 years in San Francisco.. The Giants had the best record and were on pace to win 103 games until the All Star Game. But since then the All Star Break Giants have a .333 record , worst in baseball over the span (which has continued at a similar pace since this writing). 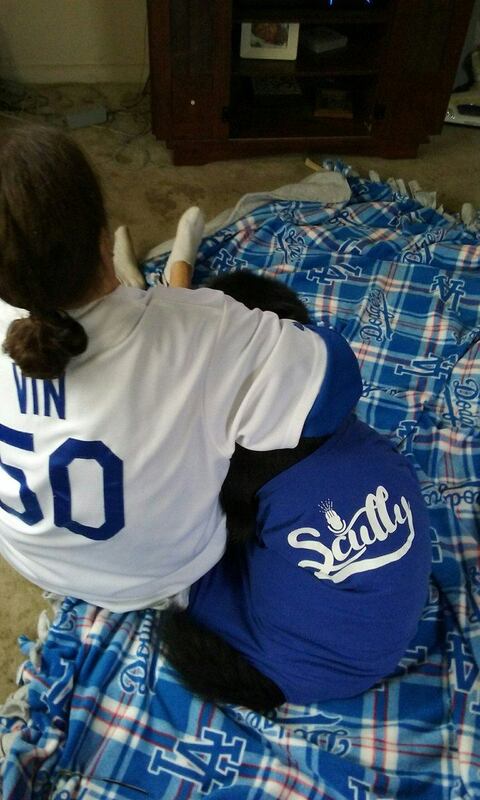 Now fans are beginning to worry and face perhaps an ‘even year’ without a World Series. Giants fans have taken for granted Giants winning. In the past the Giants would have some bad streaks but always came out of them, sometimes almost magically – but they recovered. This year’s slump has gone on longer than others and the Giants are on a downward spiral, now three games behind the Dodgers after being eight games ahead at All Star Break. But this year is different. The team and and fan base brought up on the ‘mystique,’ if you will, of Barry Bonds , AT&T park and manager Bruce Bochy. Perhaps it was no mystique but something else – and that ‘something’ that may not be mystique at all may be catching up to the team all these years later. 2) The Giants have overpaid, aging veteran players signed to lengthy contracts, such as Matt Cain and Jake Peavy and even Brandons Belt and Crawford, along with newcomers such as Will Smith and Matt Moore and Jeff Samardzija and even Cueto , which limits both budget and roster space for acquiring BETTER QUALITY (and expensive) top players. Only Cueto has had a year the Giants could be truly happy with despite a second-half drop-off like most all other players on the team. It’s not easy to dump $40 million-plus contracts; they should have learned with Barry Zeto, Tim Lincecum, Aaron Rowand, et al. For example , the Giants lose out on players like a Duvall, for whom they had no roster room and basically gave away to Cincinnati, where he’s already hit 33 homers, far more than any player has hit for the Giants, because they were committed to a much more expensive, slumping Brandon Belt at first base (15 homers). 3) Change in General Manager / Dark Modus Operandi -Indirectly, the change of General Managers, from Brian Sabean to Bobby Evans may have made some difference, despite that both probably still work somewhat together . It’s not that Sabean is any better than Evans in making trades. In fact Sabean was not the genius for which he is sometimes credited . We are told that Sabean had a reputation for not returning calls from other GMs . He also seemed to miss out on the better players and, instead resort to acquiring players with marginal pasts, like Jose Guillen, Guerillmo Moto, Chad Gaudin or a player with good stats, like Melky Cabrera , but who got there by less-than-honorable means. However, Sabean got lucky and was rewarded for his devious ways, until now. While he didn’t compete for the bonifide sluggers and top pitchers, the players Sabean DID pick up made a difference in the past; they were often KNOWN or likely PED users; how else can one explain Marco Scutaro’s 100 point batting average increase at age 37 after coming to the Giants from Colorado to propel the Giants to the World Series in 2012; similarly with Cody Ross in 2010 not to mention regular season acquisitions (Huff, Burrell, etc- see below). Only in the Giants ‘culture might one expect to see such ‘over-the-hill’ players suddenly rise up for one ‘last hurrah’ (and a lot of bucks) in the process. Other teams, at the time, knew better, but, of course, the Giants , with no qualms about signing tainted players on the cheap, would benefit -until now when we see what happens without those ‘difference-making’ late season acquisitions, tainted or otherwise. As noted above, there were other regular season Giants acquisitions such as Aubrey Huff and Pat Burrell who would suddenly put up mysterious career years in 2010 only to drop off the next year as quickly as they improved the previous year; we saw Scutaro disappear the same way after his .350 half year with the Giants. Without these ‘black market’ guys the Giants wouldn’t have made it. This may be the key reason for the Giants drop off. READ ON. While the #SFGiants have been not only the leaders of World Series victories in the last six years, they’ve long been the leaders in PED use, what with 26 KNOWN PED users since teh acquistion of one Barry Bonds two decades ago. 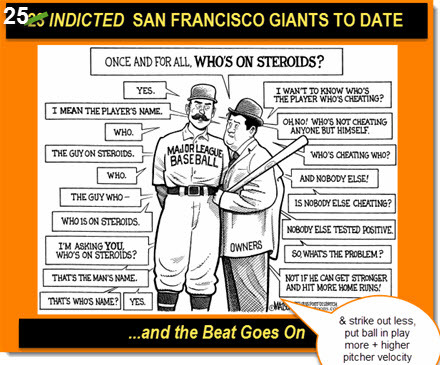 The Giants were the first team to master the use of steroids / PEDs (knowing when and which ones to use) in the home base of BALCO in liberal San Francisco. While they never won a World Series with Bonds the ‘culture club’ was learning well those ‘secrets’ he told everyone ( in a forgotten 2002 interview) that he would teach his fellow players. Bonds may have missed out but by 2010, an unlikely Giants team racked up its first World Series in 56 years with unlikely major contributions from aging ‘give away’ players like Andres (Adderall) Torres, Aubrey Huff , Pat Burrell and the Giants first of several ‘September Surprises,’ Cody Ross. GM Sabean had never been a very good trader -Billy Beane across the Bay was much better though never saw a single World Series- and realized he could pick up these over-the-hill /tainted players who would go to any lengths to bag one last big paycheck and a World Series along with it. With two key KNOWN PED users on the team in 2010, Sabean would double down and pick up four more for his World Series runs in 2012 and 2014 (despite later denials from owner Larry Baer that the team would pursue any more PED players due to its reputation). The Mitchell Report was a mere blip on the radar in San Francisco while Barry Bonds got off Scott free thanks to the liberal San Francisco Ninth Circuit Court of Appeals and Bonds remains a hero in San Francisco to this day (even though anyone will acknowledge that he had some help in hitting all those homeruns – and that most don’t care). The Giants were ahead of the other teams in PED usage and would take all the ‘bennies,’ (eg hand eye coordination / not striking out, increased power and hitting, better and faster pitching and better defense) to two more World Series, despite sneaking into the playoffs as a Wild Card . 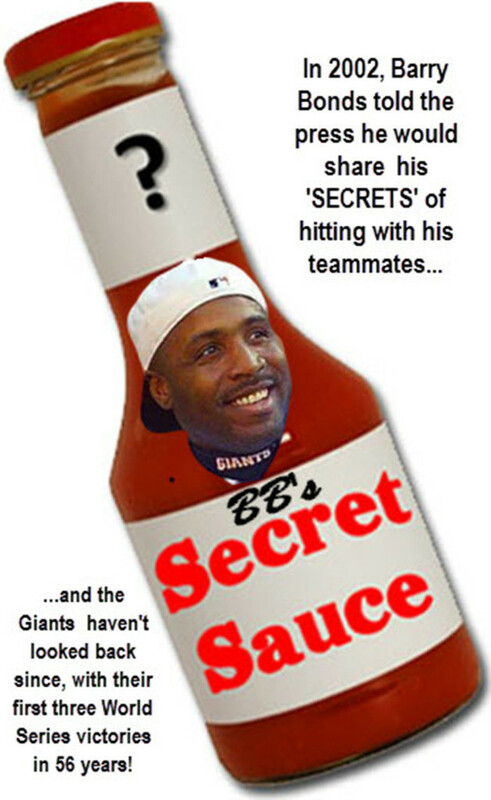 Only with their patented or shall we say ‘PED’ed’ late season and playoff runs did the Giants morph into great teams. People wondered then how they got so good just as they wonder now how they got so bad. How could a team suddenly stop striking out and keeping the ball in play, upsetting pitchers while mowing down better playoff teams (Detroit, St. Louis, Cincinnati, Washington, the Dodgers, etc) 2010, 2012 and 2014. Well, just as the Giants were the first to benefit from PEDs they may now be the first to show signs of losing that edge due , in part, to better and increased drug testing. Other teams’ players may be USING more without knowing the refinements of when, what and how to use -and they are getting caught in record* numbers in 2016 (notably Dee Gordon, Jennry Mejia-lifetime ban- and over 10 others through August, 2016). Meanwhile, it appears that Giants players, knowing better, have had to go on and off the PEDs with the knowledge of increased and improved drug testing in 2016. While it’s hard to glean exactly how often so-called ‘random tests’ are given, we’ve heard from none other than Big Papi, himself, that testing frequency has about doubled in 2016 from 2015; no wonder, perhaps that Big Papi is re-tiring of trying to beat the system. (play on words) So, not surprisingly the Giants numbers in September have NOT gone up as in the past as the team free-falls in historic numbers while also, for the first time, not getting that ‘September Surprise’player in 2016 to help propel them, ala Scutaro and Ross. Combined with the earlier reasons of scheduling and aging, overpaid players, the Giants have finally fallen in this an even year (though they may still sneak in playoffs as of this writing with three games to go. 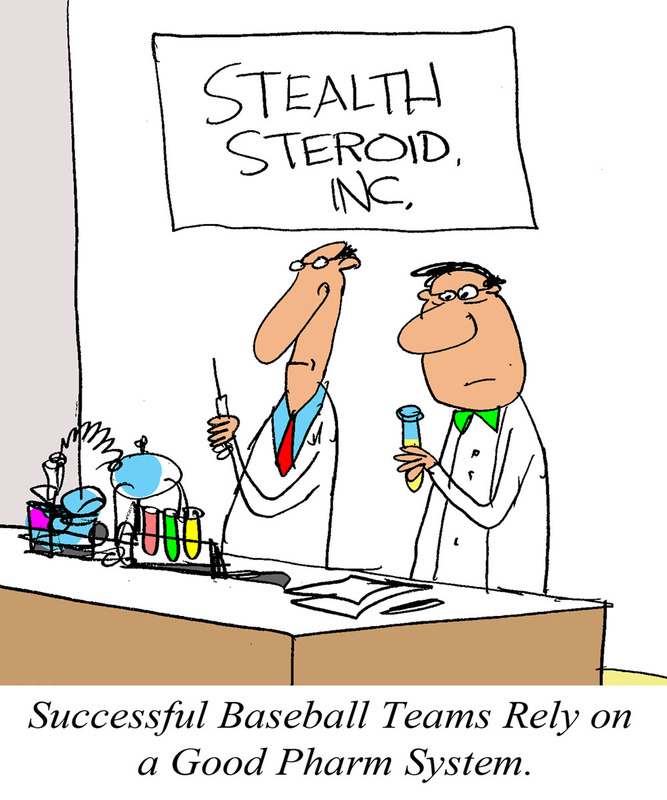 * natural MLB testing rather than Biogenesis or Mitchell Report ‘busts.’ READ ON to explain in further depth. Despite a busy August trading market, this year the Giants went legit but still haven’t seen one of their acquisitions produce like the lesser names of past years, e.g. Cody Ross and Marco Scutaro ; and it’s looking less likely that they will, especially with the competition for the wild card. The recent Giants trades did not appear to involve marginal or tainted players like Marlon Byrd or Michael Morse. Whether acting in tandem, or if working alone (if so give him credit for playing it clean), Bobby Evans picked up slightly above-average players in Eduardo Nunez, Will Smith and Mat Moore, who have yet to establish themselves with the Giants; coming off Tommy John surgery, Moore is signed for three years. Whether Sabean did or didn’t inculcate Evans in the art of acquiring tainted players cheap, this one looks like the type of trades the Giants made before their World Series runs – Aaron Rowands, Rennie Stennetts and Nate Shierholtz,’ the latter who would later be busted for using PEDs, like Byrd; the Giants taught them well (Ha!) . After repeated failures making normal, if ineffective trades, like that of Rowand, Sabean started concentrating on the ‘black market’ of tainted and/or questionable personalities. And, the next (World Series) years we would see a number of players come through the Giants – indicted or otherwise – who appeared shady, with that strong contingent that came via Kansas City around the time the Giants got Cabrera; these included a raft of Cabrera Venezuelan ‘homeboys’ like Melky’s good buddy Gregor Blanco, Mijares, Abreu and Guillen. In the next World Series years a good half of Sabean’s acquisitions would involve KNOWN PED users and/or questionable ‘talent’ like Scutaro and Ross and Gaudin, for example, who would temporarily play above their heads – long enough to almost single-handedly result in World Series. While only Melky Cabrera and Jose Guillen were indicted PED users, it would be no surprise to learn through another Mitchell Report or something similar that any or all of these other ‘homeboys’ were also using PEDs . We Don’t think Sabean taught Evans how to do the sketchy stuff. So far this year the Giants haven’t a known PED player on team, this r after seven KNOWN in the past 5 (World Series) years. While PEDs haven’t gone away the MLB testing has tIghtenEd up. Players are being tested twice as much this year and must be doubly on guard. Thus we see more hot and cold streaks during testing and none testing time. First half of 2016 the Giants schedule and a lot of on-field breaks that went their way favored them and helped give the Giants the best first half record in baseball but it wasn’t everything. . Every other week it seemed like they were facing weak Western Division teams Arizona, San Diego and Colorado… and they were! Those teams weren’t able to figure out Cueto and Samardjza as other teams would do following the All Star Break when the schedule turned on the Giants and they began facing REAL teams…the Cubs, Boston, Washington and even Philadelphia, PIttsburgh and both New York teams would fare well against them. Plus they stopped getting the breaks they did earlier. As Noted, MLB has roughly doubled the number of drug tests. Players are given approximately 10-20 per year, according to a quote from David Ortiz (No wonder he’s retiring to get away from the ‘tightening’ testing. Players must be more and more careful, thus the hot and cold players working around testing. Don’t be surprised to see more additions to the already highest (eight) number of idicted PED players so far this year. So, it’s not so surprising to see the Belts, Pences,Crawfords, et al run into more cold streaks the second half, especially playing against other teams. Still somewhat hot Pagan and Span are playing for their careers and may be willing to risk more – and they’ve paid their price with injuries, perhaps having some connection to PEDs, though we can’t prove it. For us, Span is this year’s Marlon Byrd, with less power YET he’ll probably have his biggest homerun season this year- who just hasn’t been caught, in our opinion. The Giants are a mere bunch of interchangeable parts. Even with Posey you don’t lose much when one goes out of the lineup. They bring in these unlikely guys like Adrianza, Gillaspie , Pena and even Green hitting about as good , or better than the regulars. Wonder why. WHY ALL THE STREAKS and STREAKS WITHIN STREAKS? Meanwhile, Giant players would go on hitting and non-hitting within team streaks. Seocond half players Belt and Pence would stop hitting. Belt, an All Star would drop 50 points in average while Hunter Pence would not find his groove once off the disabled list. The other Brandon would go on his only hitting slump about the same time except for one game when he went seven for seven, tying a long-held major league record! Sure, the Giants began facing more REAL pitchers the second half. Perhaps, as Big Popi has noted, drug testing has been more frequent of late and maybe on those days or weeks of tests, certain players slumped without their fixes. Others might have completely gone off the stuff under the heavier scrutiny or just didn’t want to take any more risks to their bodies – think Aubrey Huff after 2012 World Series year when he couldn’t buy a hit in 2013 following that unlikely late ‘career year’ year . As Conte tells us , it’s now as simple as popping a pill or getting injected, as needed – for those who still want to (perhaps Pagan and now Denard Span, who’ve suddenly upped their game at advance ages with unlikely numbers. ) Like magic, a player can take PEDs in the morning and have them out of their system by the end of the day. So, a player can benefit from improved game performance for threat narrow time span while not risking a drug test; players are using informed of ‘random testing’ ahead of time. We hear so much about the PEDS-infused improved hitting but don’t forget, pitching and fielding is helped out, too, by PEDs. Homers are said to be up about 20% this year but pitching velocity may be up more than that, noting how every team seems to now have at least a handful of 97 mph-throwing (some unhittable) pitchers. Wasn’t it the last couple years that Crawford went from a good to great fielder along with his sudden power (21 homers last year for the shortstop). As we note below, drug testing in baseball has become much more frequent – almost doubling that of 2015- and certain teams with better known drug ‘cultures’ may have seen the light and cut back on PED use, for fear of being caught. 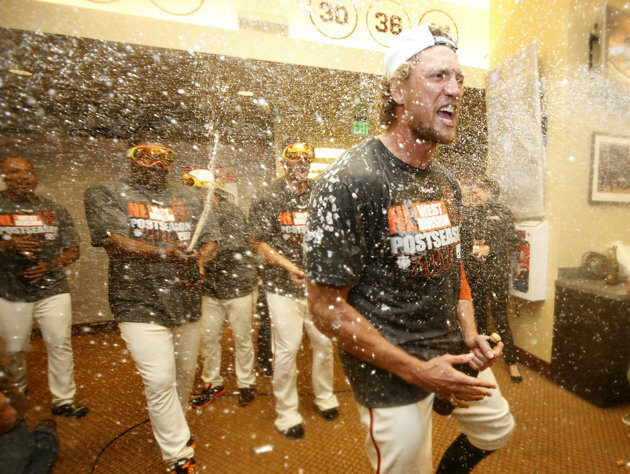 As the team having had the most PED users, the Giants may be the first to cut back on PED use. In the sudden drop-off in production by the Giants we’ve also seen a lack of power. A 390 foot fly out by Brandon Crawford might have gone 425 feet and over the fence in Dodger Stadium to have won the game, Aug 25. 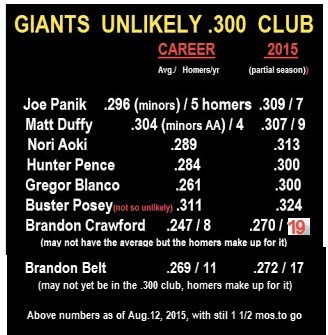 But homers have become far and few between for the Giants, with no player having more than 14 as of August 25. And , homers are an important part of the game, especially if hitting averages are down, which they are on the Giants. A player with 20 homeruns has to have at least 20 runs batted in but, in contrast, there’s no guarantee that a .300 hitter will have any RBI’s without other players on the team helping out, with presumably higher batting averages. In the World Series years and Last year, the Giants were still able to put up a decent supply of homers – shortstop Brandon Crawford had a surprising 21, his most ever – but this year all Giants except Pagan and Span are down in homers. From 2014 (above) Now PLAYERS such as Crawford and Belt are hitting even better in 2016 so the decline is not really universal. Never Likely .300 hitters, Crawford and Belt probably continue hitting and fielding above their natural ability, thanks in part to PEDs (in our researched opinion). One can say that the Giants are no different than other teams also propelled by players using PEDs. We now know how Dee Gordon was able to lead the league in hitting – and running – after being busted this year for PED use. David Ortiz has not been busted but there have long been rumors of his use of PEDs, which his 35 homers and .300 average at age 40 would indicate; not so surprising that Ortiz would suddenly decided to retire amidst the tightening of drug testing, which Ortiz himself infers. Others like Justin Turner of the Dodgers or Altuvie of Houston have shown unlikely sudden increases in power or average. KNOWN PED users like Nelson Cruz and Melky Cabrera continue to hit above expectations and get away with it, though these things could change with the tightening of drug testing. The Giants, long-time leaders in number of PED users who have plied their trade with over 25 since Bonds, have always been one step ahead of testing, knowing what or when to use, etc. It didn’t hurt that Barry Bonds and BALCO have been in their back yard teaching them well all these15 years since Bonds put steroids on the map in 2002 when he bulked up to hit a record 73 homers. Now, players don’t have to bulk up. They can get away with PED use without anyone noticing -until they get caught. But, as Balco’s Victor Conte has said, a player has to be ‘dumb or dumber’ to get caught using PEDs. And, the Giants are far from dumb, always being well ahead of the curve, save for a rare Melky Cabrera or Jose Guillen gaffe. Because of the Mitchell Report we KNOW that over 20 players were using PEDs PRIOR to the World Series years. Because there has been no Mitchell Report since then we only know of the five players-Guillen,Torres, Cabrera, Mota,Morse- who were CAUGHT (and who coincidentally were instrumental in helping the Giants achieve all their three World Series). But, where there’s smoke there’s fire and just as we saw a team culture grow around Barry Bonds with Rich Aurilla, Matt Williams, Benito Santiago, etc., there are no doubt others on the Giants participating in the same culture that has carried the team since Bonds in liberal San Francisco, where people are not so critical about PED use. Because the Giants have been the most ‘up’ on PED use and have most used PEDs may they may also be the first team to STOP them , or to slow down, seeing the increased scrutiny from above. How else can one explain the sudden simultaneous production drop -off by so many players on the team. (Factor in the fact that the Giants have also been playing better teams the second half.) Even though most players are still hitting above .250 for the season, we’ve seen post-All Star drops of 30-50 points from virtually all regulars except Hunter Pence. Interestingly, but not surprising, normally non-descript bench players like Conner Gillaspie and Kelby Tomlinson have been doing well of late, as had Grant Green and Pena earlier in the year when many of the regulars were out of the lineup. Though a lot of factors , such as schedule, do have some baring on the the great Giants Fall, it’s largely that the Giants haven’t been able to come up with those one or two late season ‘extra men’ to compliment questionable ‘regulars’ often playing above their heads thanks to the likely, long-term PED culture on the team. Begun with Barry Bonds and BALCO way back in 1997, the Giants have developed and perfected the PED. Though Barry Bonds’ teams would never see a World Series championship, by 2010 newer but similar Giants teams had gotten PEDs down to a science , knowing what and when to use . Unlike this year so far , previous Augusts and Septembers (2010-2014) featured sudden winning streaks by the Giants while other teams were facing the dog days of summer. In 2010 it was largely Cody Ross to compliment the nucleus which included Andres Torres, having a career year thanks to Adderall PED. In 2012 it was 37-year-old Marco Scutaro who saw his batting average skyrocket from .265 at Colorado to .350 once coming to the Giants in August just before Cabrera’s suspension. What timing! Cabrera had already enough game winning hits to propel the Giants into the playoffs and Scutaro, another Venezeulan homeboy – the Giants had eight(!) 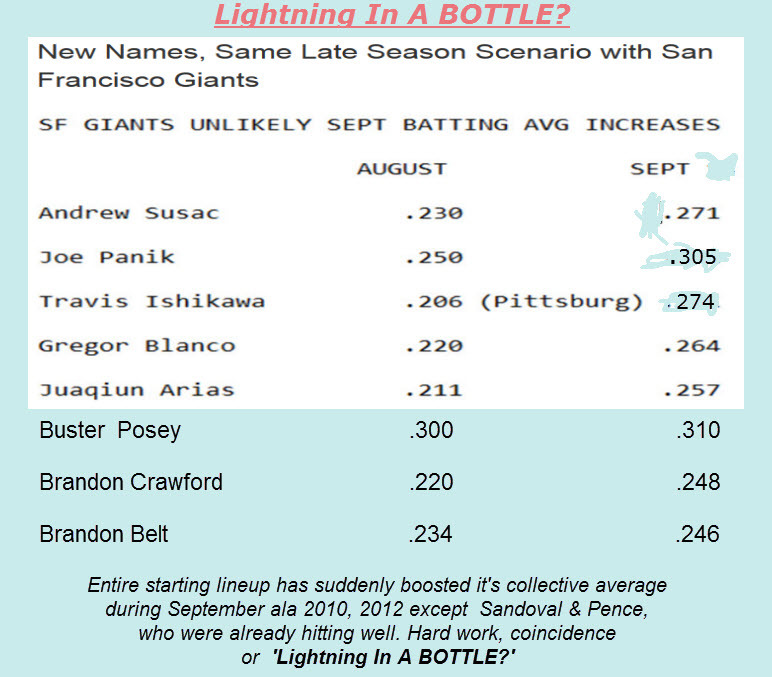 and Melky buddy -who the Giants got for nothing would continue Cabrera’s unlikely ‘magic.’ In 2014, it wasn’t one guy but a raft of them…particulary Joe Panik and Mat Duffy who would out-do their minor league averages after the Giants went through six other second basemen; guys who never hit for power would suddenly hit homeruns in cavernous AT&T! But there were also light-hitting Travis Ishikawa who would come over from PIttsburgh to compliment newcomer Hunter Pence and Pablo Sandoval, all who performed out of their minds in the playoffs. Speaking of the playoffs, in all three world series years, the Giants only improved with time . As good as they were in August and September they were -amazingly- better against the best talent in the playoffs and World Series. Now August is done but there’s still September. And, the Giants Will Try to Win At Any Cost, While it won’t be as easy as before, don’t be surprised to see the Giants pull another one out of the hat in 2016. It’s funny how even the Giants rookies and younger players suddenly improve late season. Last September Mac Williamson and Parker looked to become the new Panik and Duffy; this year they might. Already this year we’ve seen no-names like Pena, Green and Gillaspie come up to fill in more than adequately during the first half season. It just takes one or two unlikely waiver wire ‘rejects’ ala Cody Ross in 2010 or a pickup like Marco Scutaro in 2012 who will find the Jints Juice again. But it will be harder this year with more teams gunning for those two NL wild card spots and an effort to block the Giants from yet a fourth questionable championship. Yes, questionable… The Giants this year are basically a similar team to the World Series winners but without that ‘extra man’ be it Ross, Scutaro or KNOWN tainted players like Melky Cabrera, Andres Torres, Jose Guillen and Michael Morse, without whom they wouldn’t have been in any of those three World Series – not to mention the tainted players NOT CAUGHT – and the Giants have had more than any other team and likely continue to have a number of them. If no new names come along don’t be surprised to see a Williamson or Parker – or even the old or new Heston pitching – lead the Giants out of sureal darkness once again. As fans of REAL baseball, we hope this doesn’t happen as we know if will probably be the result of unnatural means (now having seen it happen three Giants world series years in a row). Say it Ain’t So, Joe, but if it does happen yet again, you can say you know the REAL, NOT-SO-HIDDEN STORY BEHIND THE SF GIANTS AND THEIR (FOURTH?) WORLD SERIES. Another reason things may be a more difficult to repeat in 2016, is because The Giants have gone out of their way to sign their old and new trades like Mat Moore to long term contracts. If a player is not performing well do you really want to hold their contract ewrerwewre and roster spot for years to come? Similar long-term signings of veterans like Jake Peavy and Mat Cain make it more difficult to have roster space – and money- for new players. It’s either continue to roll out such players who aren’t performing well, like Peavy and Cain, or dump their contracts and trades at this point become difficult or impossible. The Giants did the same thing with Barry Zeto and Tim Lincecum. If one believes the Giants really got their value out of these guys it’s only because of the other darker factors that have falsely enabled the team to win as many games and playoffs and World Series as it has. 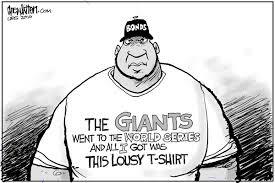 Some have become so programmed into the Giants winning they still think the Giants will turn around. Says writer RICHARD JUSTICE it’s ‘not that complicated’. They have a ‘culture of winning’ and he says the Giants will turn around.